Homemade gifts are the best, especially when they're made to thank someone for going above and beyond. These Summer Berry Cobbler Bars were a last minute thank you gift baked for someone special (you know who you are). They're delicious and so easy to make, you just might want to bake this sweet treat for someone sweet yourself! Line an 8x8 square baking pan with nonstick foil or spray regular foil with nonstick cooking spray. In a large bowl, whisk together the flour, 1/2 cup of the brown sugar, baking powder, cinnamon and salt. Make sure there are no lumps of brown sugar. Add the cubed, cold butter and combine with a pastry cutter until crumbly. Add the eggs and stir to combine to form a "scraggy" looking dough. It doesn't have to be completely cohesive but there should be no dry flour in the bowl. Press slightly more than half of the dough evenly into the bottom of the prepared pan. Bake at 400 for 5 minutes. Reserve the remaining dough for the topping. While the crust is baking, place the berries, flour, brown sugar, lemon zest and juice in a small bowl. Use a rubber spatula to combine. Remove the crust from the oven (after 5 minutes of baking) and evenly spoon the berry mixture over the baked crust. 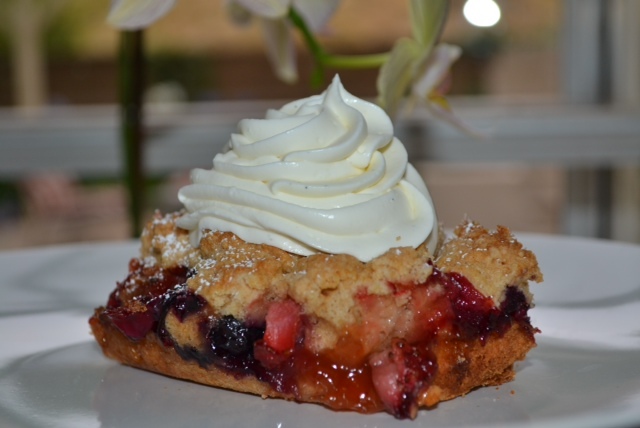 Crumble the remaining dough over the fruit mixture and reduce oven temperature to 375. Bake at 375 for approx. 20-25 minutes or until golden brown and bubbly. Remove from oven and allow to cool 15-20 minutes before slicing. Enjoy warm with ice cream or fresh whipped cream or serve at room temperature sprinkled with some powdered sugar. Just be sure to save some for yourself! Store leftover bars in an air-tight container at room temperature for 1 day or refrigerated for up to 2 days. I've been on a bit of a cupcake kick lately. There's something about a cupcake that brings a smile to everyone's face, young or old. Maybe it's the fact that a cupcake is like your own personal cake. It's as if it was made just for you and you don't have to share it! This time I'm sharing the recipe for these delicious Hummingbird Cupcakes with Cinnamon Maple Buttercream Frosting. The banana and pineapple make them moist and flavorful while the toasted pecans add texture and crunch. The Cinnamon Maple Buttercream frosting compliments them perfectly. I hope you'll give this recipe a try! In the bowl of a stand mixer fitted with the paddle attachment, cream butter until light and fluffy, approx. 2-3 minutes. Add butter and beat at medium speed until creamy. Add eggs, one at a time, mixing just until combined after each addition. Add Vanilla Extract and mix to combine. Add bananas and honey and mix on low speed just until combined. Add pineapple and slightly more than 1/4 cup of the toasted pecans (reserve the remaining pecans for garnish). Mix on low speed just until combined. Add 1/3 of the flour mixture and mix at low speed just until combined. Add 1/3 of the hot water and mix until just combined. Repeat ending with the hot water. Divide the batter evenly between the 18 cupcake liners. Bake at 350 for approx. 15-16 minutes or until cupcake springs back when lightly pressed in the center or a toothpick inserted in center comes out clean. Remove from oven and immediately remove cupcakes from the pan and place on a cooling rack to cool completely before frosting. While the cupcakes are cooling, make frosting. In the bowl of an electric stand mixer fitted with the paddle attachment, cream the butter until light and fluffy. Add the powdered sugar and mix until combined. Add the pinch of salt, ground cinnamon, maple syrup and vanilla bean paste. Mix to combine. With mixer on medium speed, add the heavy cream and mix to combine. Increase speed to med-high and beat for 3-4 minutes. Frost and decorate the cupcakes as desired. 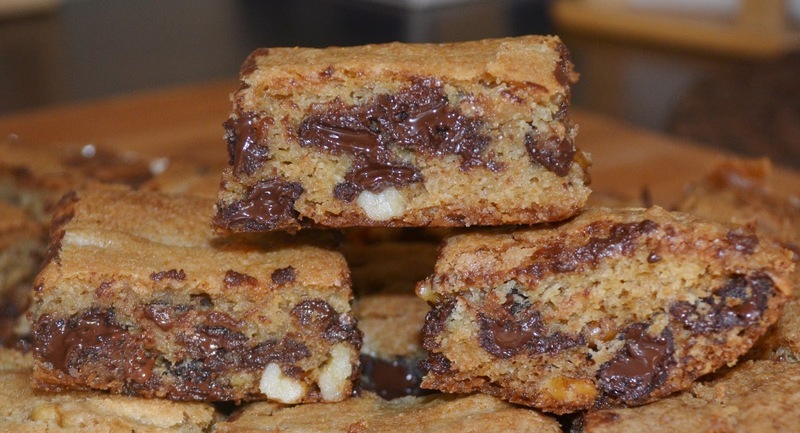 This is a great basic recipe for Cookie Bars (aka Blondies). When you don't want to spend a lot of time preparing cookie sheets, scooping cookie dough and going back and forth to the oven, the Cookie Bar is the way to go. You just spread the batter in the pan and bake, all in one shot! This recipe can be adapted using any of your favorite ingredients - M&M's, White Chocolate Chips and Cranberries, Mini Peanut Butter Cups, I've even thrown in some chopped up pretzels with the chocolate for a sweet/salty combination. But my all time favorite combination has to be chocolate chunks and toasted walnuts. If you're short on time, you can skip toasting the walnuts, but the toasting process adds a lot of flavor. I hope you enjoy this easy recipe as much as I do! Line a 13"x9" baking pan with nonstick foil or spray regular foil with nonstick spray. In a large bowl, cream together the butter and sugars until light and fluffy (approx. 2-3 minutes). Mix in the vanilla, then mix in the eggs one at a time mixing until combined after each addition and scraping down the bowl after each addition to ensure eggs are properly incorporated. Slowly add the flour mixture and mix at low speed just until combined. 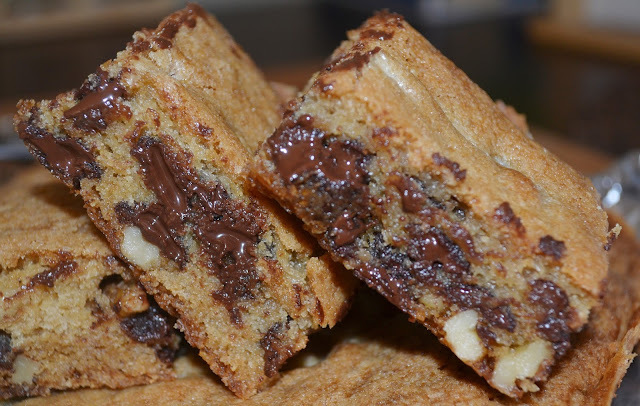 Fold in the nuts and chocolate chunks. Spread batter into the prepared baking pan. Bake at 350f for approx. 30 minutes. Remove from oven and allow to cool in pan. When the bars have cooled and set, remove from pan and cut into bars. Store tightly covered at room temperature for up to 2 days. How to toast nuts: With oven at 350f, spread nuts on a baking sheet in a single layer and roast in the oven, check and shaking pan often, until fragrant and lightly toasted. Alternatively, you can do this in a skillet over med-low heat, just be sure to check and shake the pan every now and then to prevent burning. The nuts are done when they're lightly toasted and fragrant. It's funny how excited I get when people give me ingredients to bake with. I would be perfectly happy with a box full of butter for my birthday...seriously. My friend Merry brought some extra over-ripe bananas to work and I knew I wanted to make Banana Cupcakes. These cupcakes had been haunting me since I last made them over a year ago. I remember them being the best Banana Cupcakes I had ever eaten, but I had lost the recipe.... until I was going through my notes on my iPad the other day and found it! So now I am sharing My Favorite Banana Cupcake Recipe with you! I absolutely love the texture of this cupcake; it's light, not too dense, with the perfect amount of banana flavor. You won't mistake them for dressed up banana muffins at all. I paired these cupcakes with a creamy Vanilla Bean Buttercream Frosting. I originally wanted to make a Honey Cinnamon Buttercream, but my husband vetoed that idea (hence the sprinkling of cinnamon on top). Really any of your favorite frosting recipes would work well with cupcake. Next time (and there will be many next times) I'm going to try Salted Caramel or Peanut Butter! Regardless of how you frost it, I hope you'll try this recipe for My Favorite Banana Cupcakes and that it becomes one of your favorites too! Preheat oven to 350f. Line 2 cupcake or muffin pans with paper liners. In a medium size bowl, sift together the Cake Flour, Baking Powder, Baking Soda, Salt and Cinnamon. Set aside. In another medium size bowl, combine the mashed bananas, "soured" milk, vanilla and eggs. Mix until combined. In the bowl of your electric stand mixer fitter with a paddle attachment (or using an electric hand mixer), cream together the butter and sugar at medium speed until light and fluffy (approx. 2 minutes). Add the wet and dry ingredients to the batter alternating between them - add 1/3 of the flour mixture, 1/2 of the banana mixture and repeat, mixing just until combined after each addition. Using a large cookie scoop, scoop the batter into the prepared pans dividing evenly between each cup. Bake at 350f 18-20 minutes or until toothpick inserted in center comes out clean. Remove from oven and cool in pan for 1 minute, then remove to wire cooling rack to cool completely. In the bowl of your electric stand mixer fitted with the paddle attachment, cream butter at medium speed until creamy. Add the powdered sugar and a pinch of salt and pulse a few times to coat the powdered sugar you don't create a big sugar dust cloud, then mix on medium speed. With the mixer running, add the vanilla bean paste. Then add the heavy whipping cream a few tablespoons at a time. Beat at medium-medium high speed for about a minute. Check the taste and consistency. Add more powdered sugar and/or heavy whipped cream as needed. I wanted the frosting on this cupcake to be on the creamier side, so I added whipping cream to get my desired consistency. This weekend I wanted to bake something special for my Niece Mandy's birthday. You may have seen Mandy on the blog before. For years, she's been one of our helpers for our annual Christmas Cookie Bake and has literally decorated hundreds of cookies. Mandy is out on her own now, going to College and working as a Catering Manager for a local sandwich shop. Needless to say, these days I don't get to see Mandy as often as I would like, so I thought baking these Red Velvet Brownie Cheesecake Bars would be a great birthday gift. This recipe starts off with a Brownie base, but not just any brownie, Red Velvet Brownies. The Red Velvet Brownie base is topped with a creamy cheesecake mixture then swirled with more of the Red Velvet Brownie batter...yum! These are definitely a special occasion brownie. Line an 8x8 baking pan with nonstick foil or spray with nonstick cooking spray. Place the cream cheese and 1/4 cup granulated sugar in a medium size bowl and beat with a mixer on medium speed until smooth. Add 1 large egg and vanilla extract and beat at medium speed until combined. Set aside. Place the 2 eggs in a small bowl and whisk to combine. Add the eggs to the cocoa mixture and whisk to combine. Add the flour and fold in using a rubber spatula until just combined. Reserve 1/4 cup of batter and spread the remaining batter in the bottom of the prepared pan. Pour the cheesecake batter over the brownie batter and spread carefully trying not to disturb the brownie patter. Dollop small spoonsful of the reserved brownie batter over the cheesecake batter then use the tip of a knife to swirl the brownie batter into the cheesecake batter to create a swirl pattern. Bake approx. 30 minutes or until the cheesecake batter is set (feels firm when lightly touched). Remove from the oven and allow to cool to room temp. Refrigerate for 3 hours before serving.